Cartoonists Rights Network International calls for nominations as we prepare to present our annual Courage in Editorial Cartooning award. 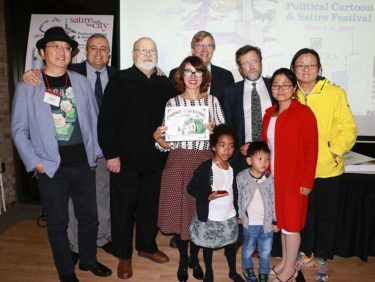 CRNI presents this award to a cartoonist who has demonstrated exceptional courage in the face of overwhelming threats while pursuing their right to free speech as defined by Article 19 of the UN Declaration of Human Rights. CRNI’s Board of Directors will consider the nominees and select a recipient. The 2018 Courage in Editorial Cartooning award will be presented on September 22nd during the American Association of Editorial Cartoonists annual convention in Sacramento, California. Note: CRNI does not award a specific cartoon for its excellence and is not seeking cartoons about freedom of expression or threats to it. We recognise a cartoonist who is under threat or attack themselves. Therefore CRNI makes no comment on the quality or intent of a specific cartoon. However CRNI will not consider cartoonists whose work advocates violence, promotes hate, or encourages racism, sexism and/or bigotry. 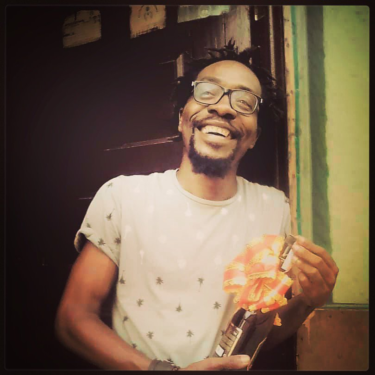 Last year’s winner was Ramón Nsé Esono Ebalé – Jamón y Queso – whose wife and daughter accepted the award on his behalf while he remained a prisoner in Equatorial Guinea. Ramón is now free.